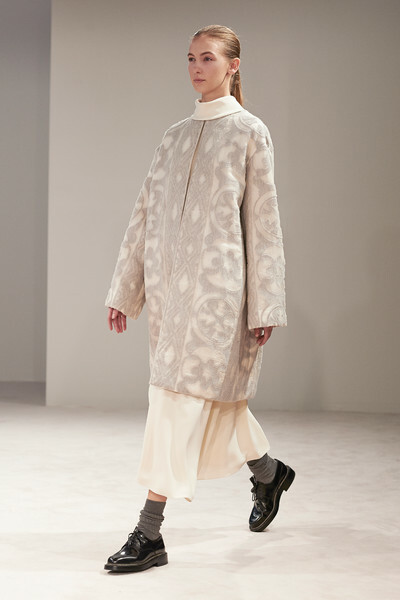 Stillness and quietude might be the one true luxury. 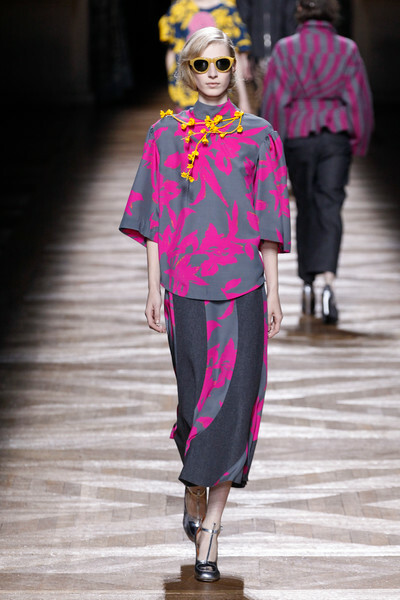 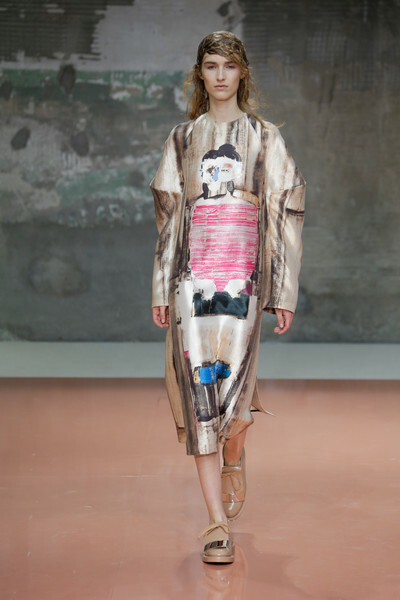 We spot gorgeous drapes and wraps and composed kimono volumes. 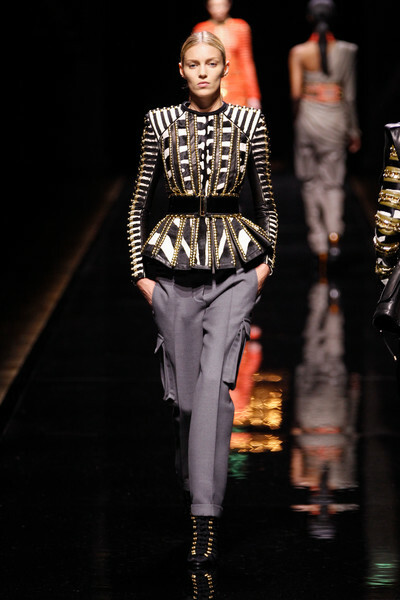 The absence of detail exposes the best in materials. 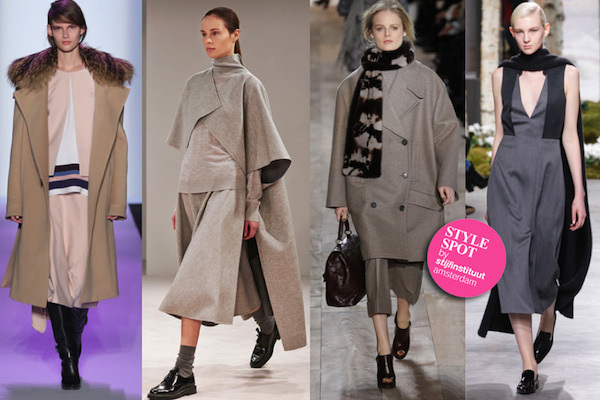 Square cut nearly monumental silhouettes gain feminine spree through the drape quality of compact and chunky yet gorgeously supple wovens. 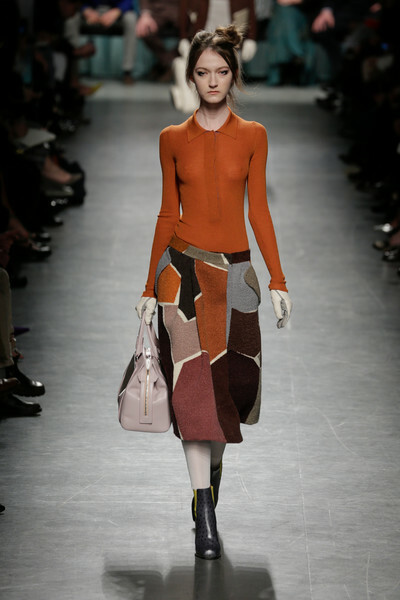 Subtle surfaces where brush effects, felted looks and heather aspects add liveliness and a natural appeal. 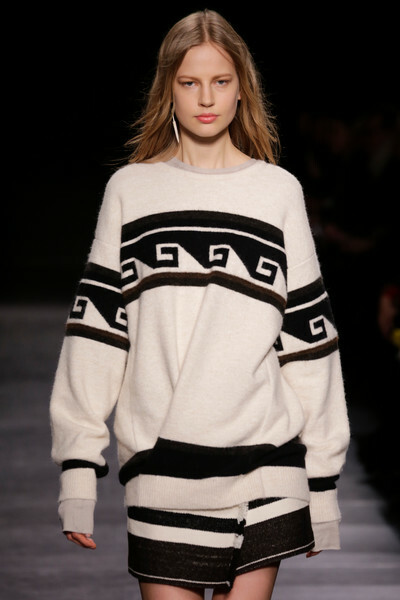 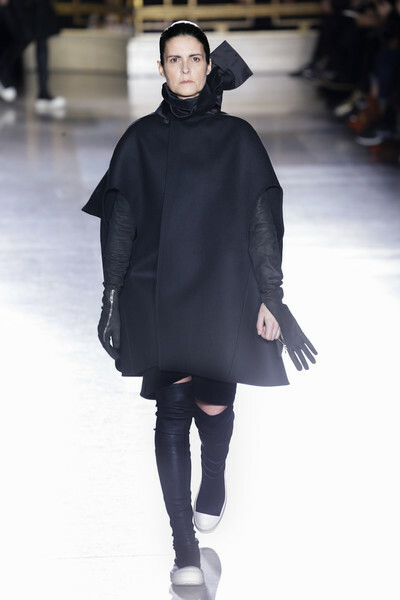 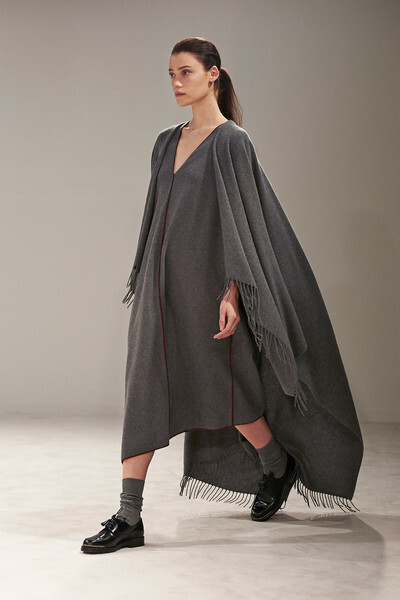 BCBG Max Azria takes advantage of the endless layering opportunities that fall permits. 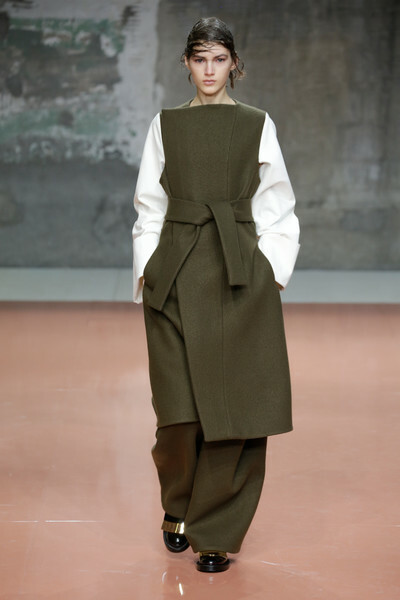 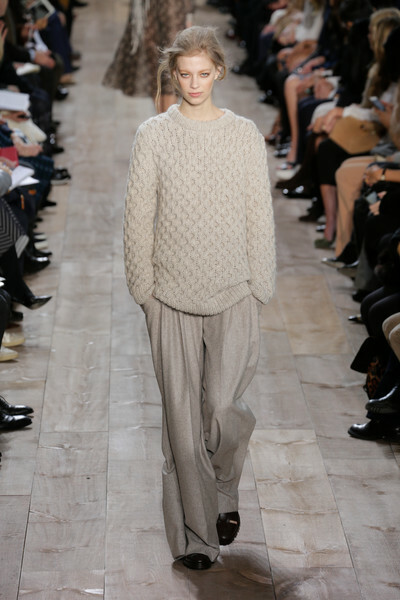 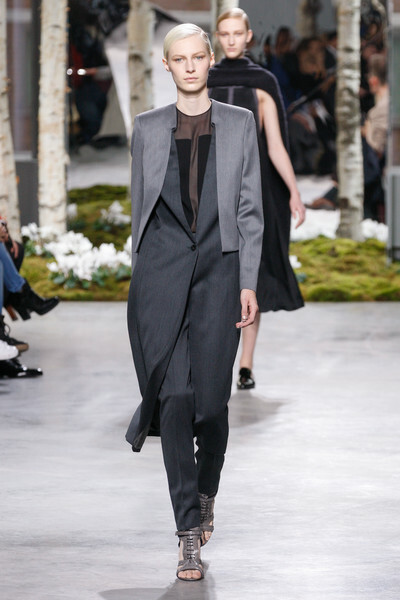 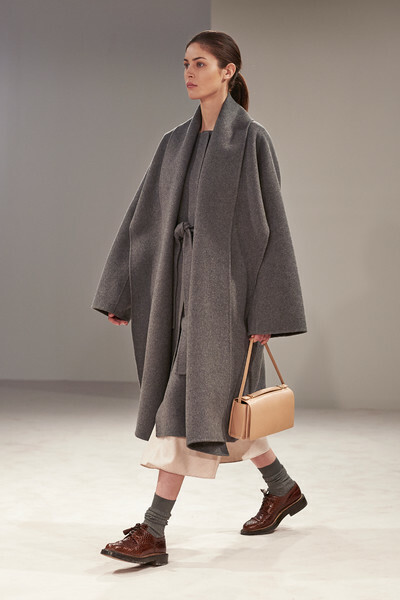 The Row shows a range that is quietly spectacular made with 900-gram double-face cashmere. 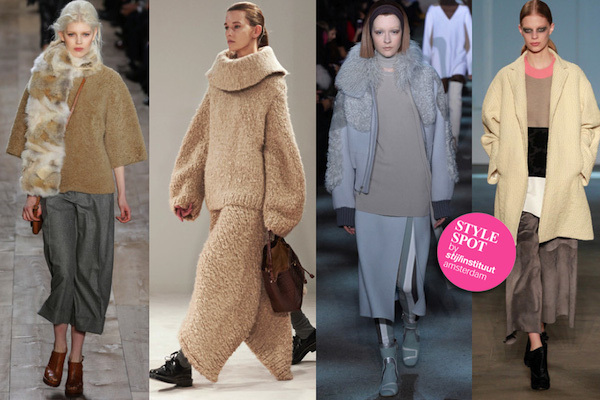 From soft and fluffy to a tranquil sculptural quality. 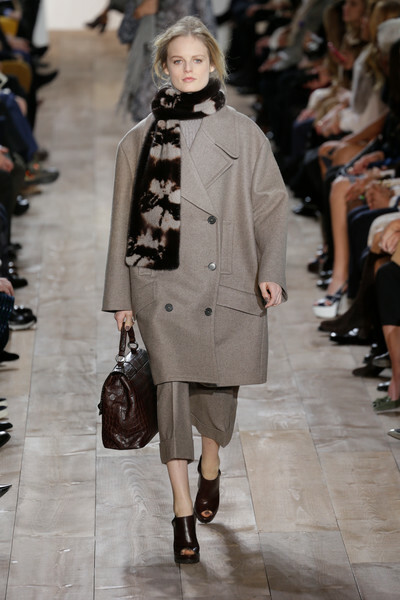 Michael Kors plays with proportions and adds a firm grip to the choice of materials where Wang for Hugo Boss exercises his tailoring qualities with strong rigueur. 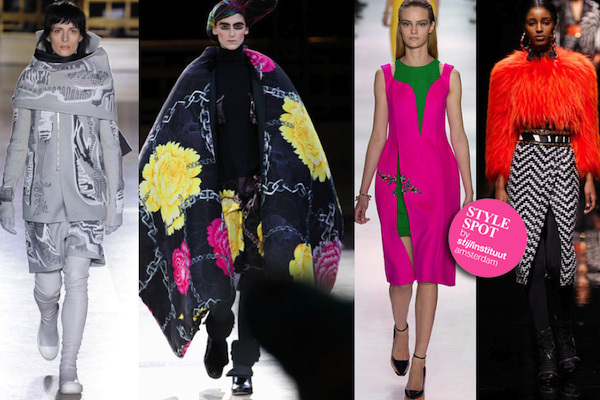 Once more the quality of cut and drape defined by the exceptional characteristics of the materials. 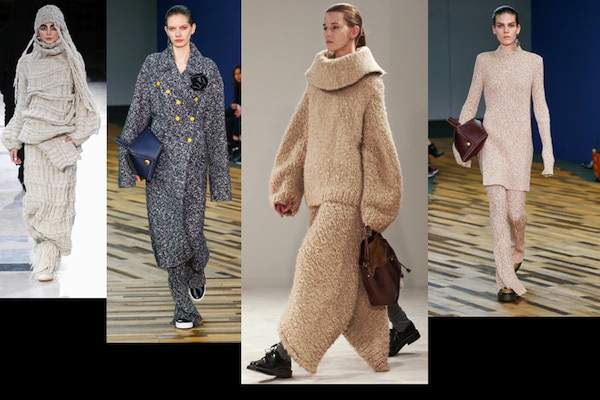 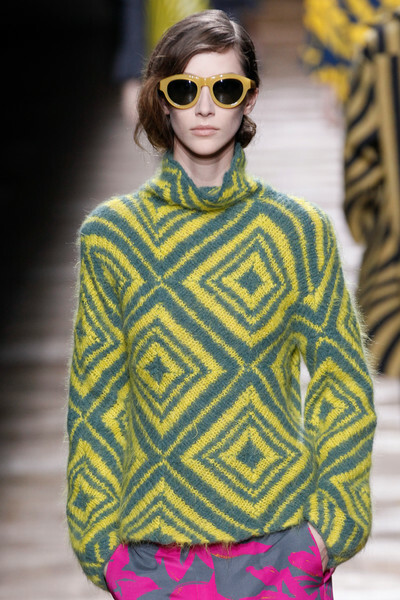 No one could anticipate the Polar Vortex but still the supersize hand-knit sweaters are warm and prodigious as were so many silhouettes this season. 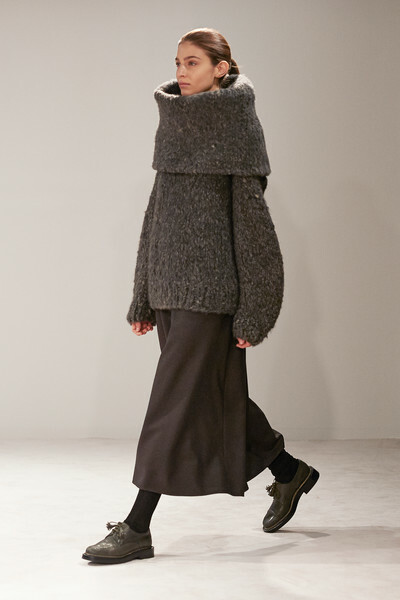 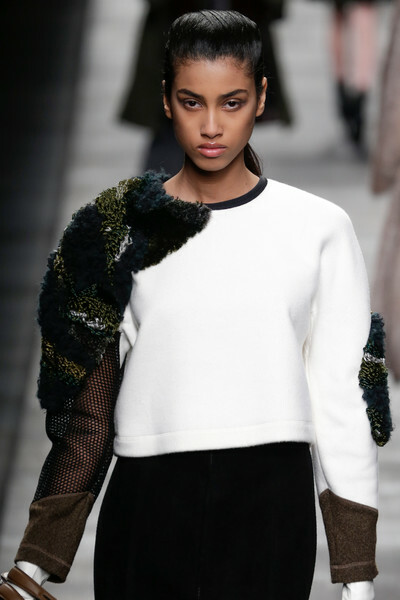 Chunky shearlings, and curly bold sweaters are round and sheltering above flapping skirt layers and drapy pants. 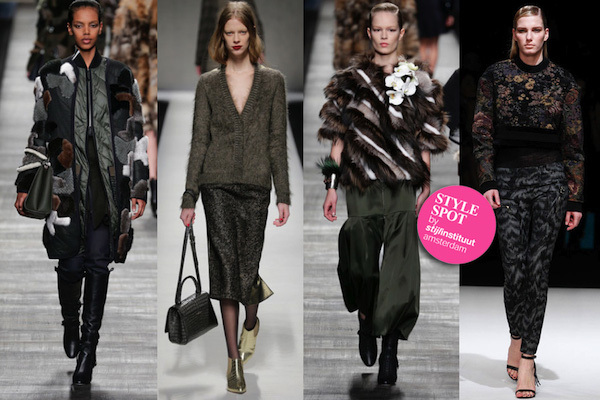 Super lush and luxurious materials flourish best in simple understated shapes. 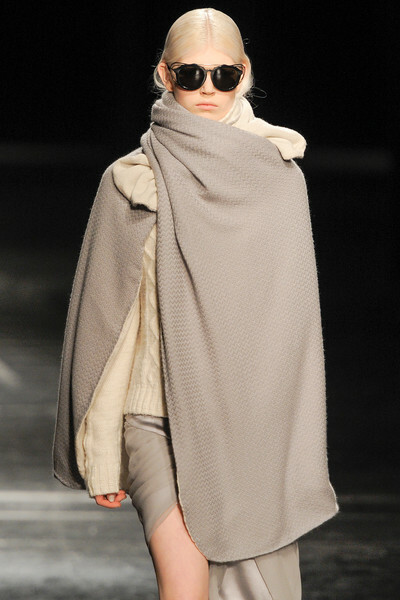 Roomy and relaxed like comforting cocoons. 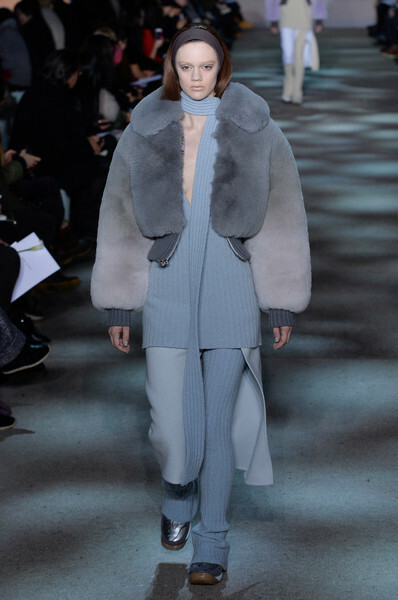 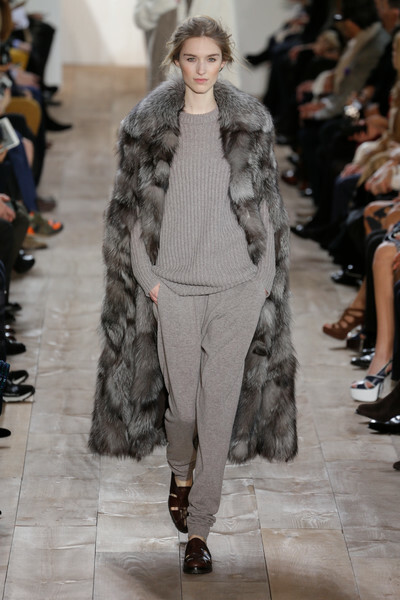 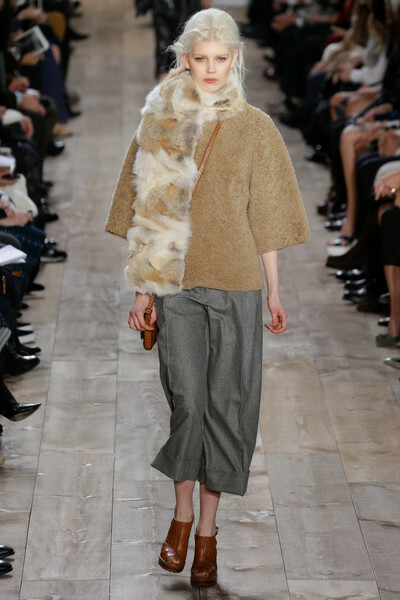 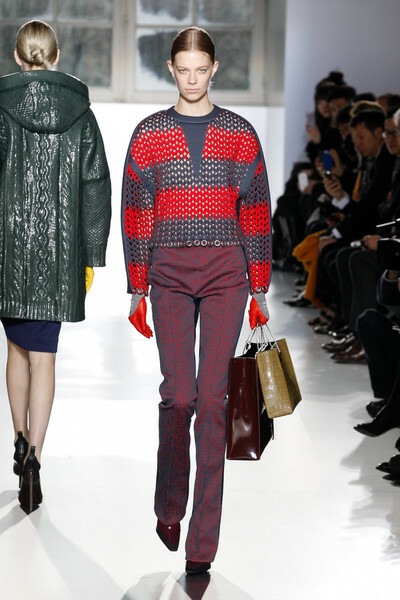 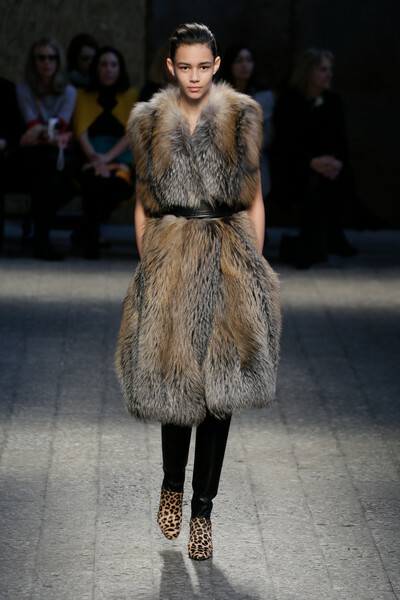 Michael Kors shows masterful shag furs, chunky cardigans and deluxe cashmere sweats on A-line skirts. 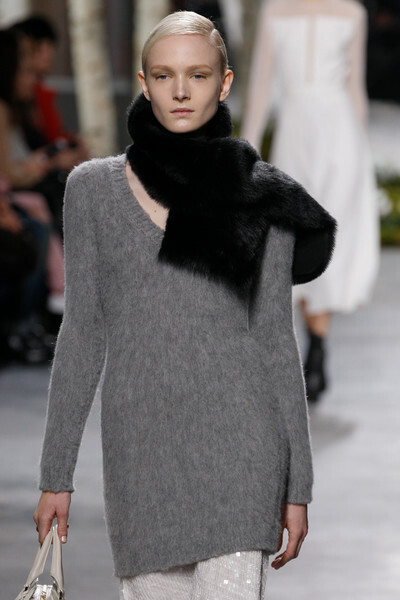 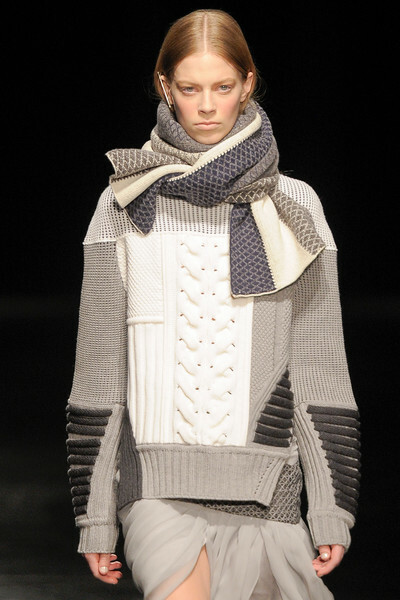 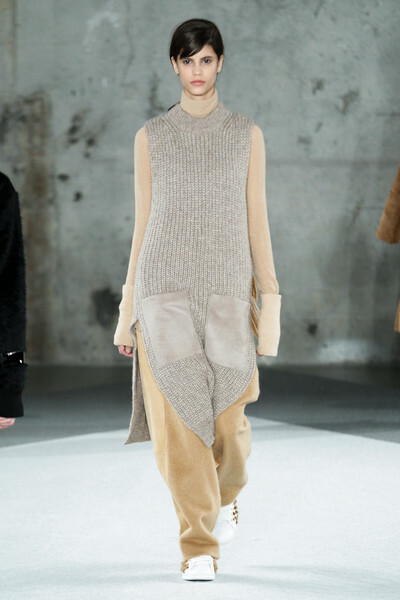 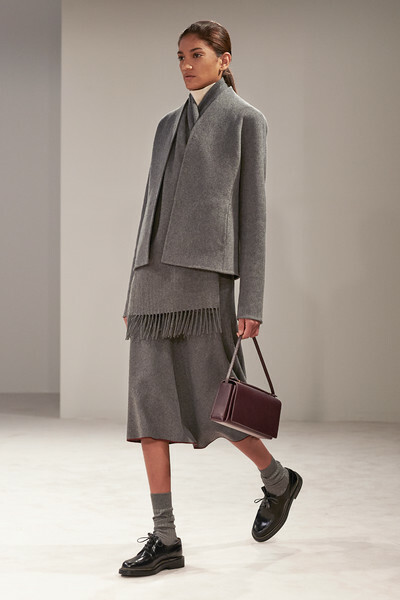 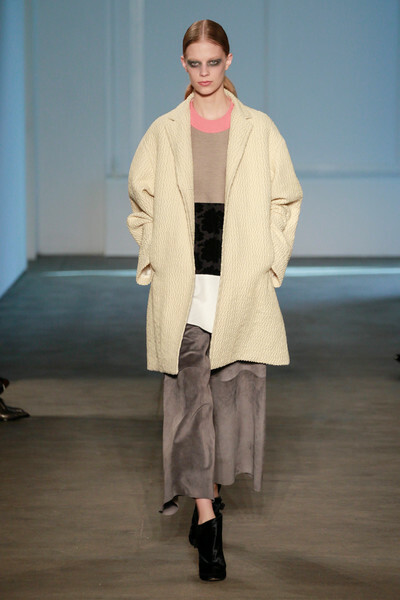 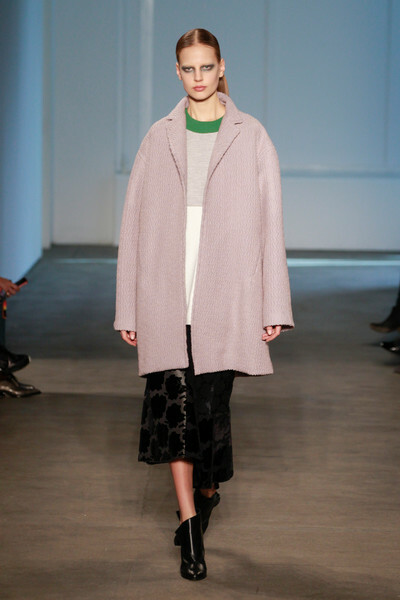 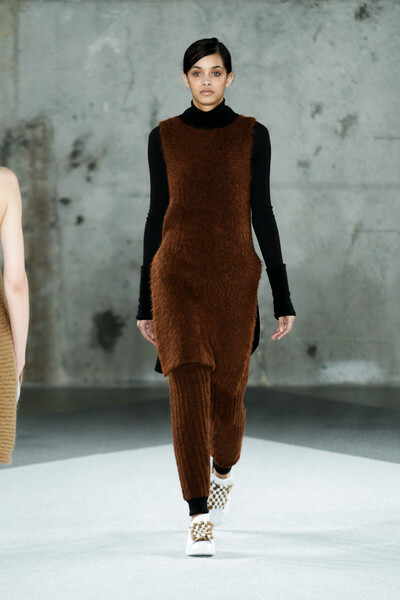 The Row luxury wraps as cowl-neck cashmere sweaters and matching asymmetric hand-knit skirts. 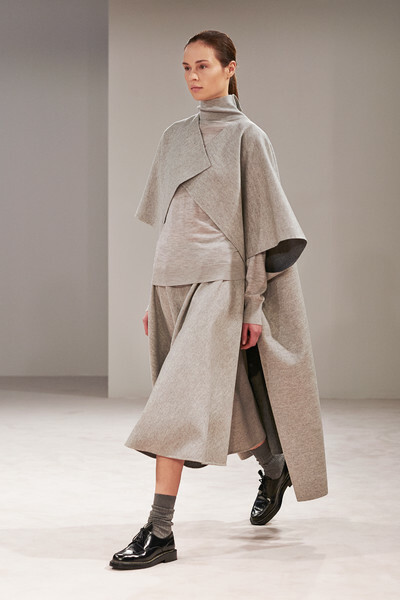 Love for comfort, exquisite materials and a soothing calmness and ease drives this look. 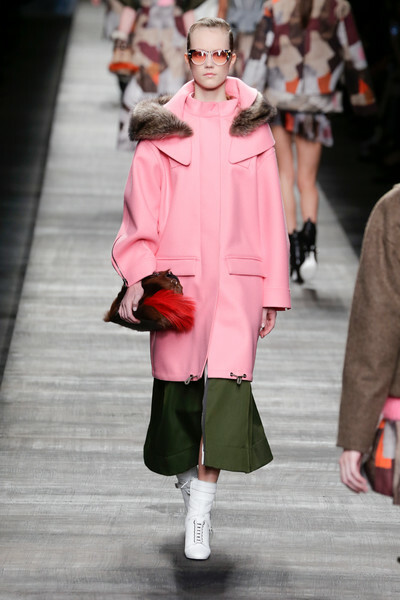 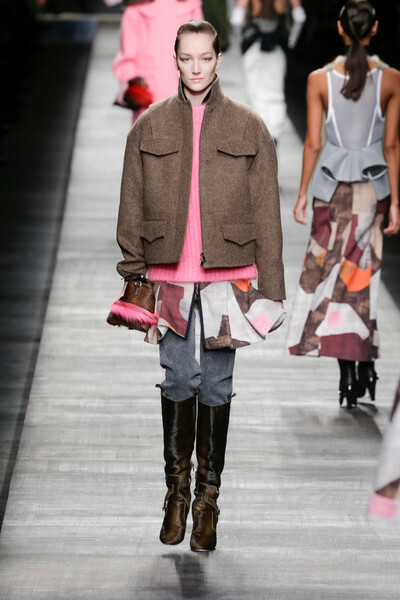 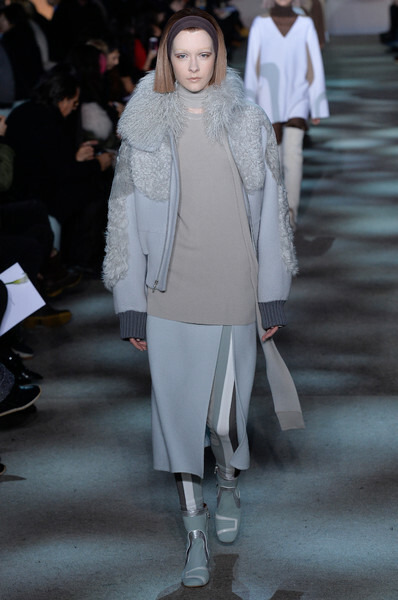 Marc Jacobs dyed his shearlings in sunset hues. 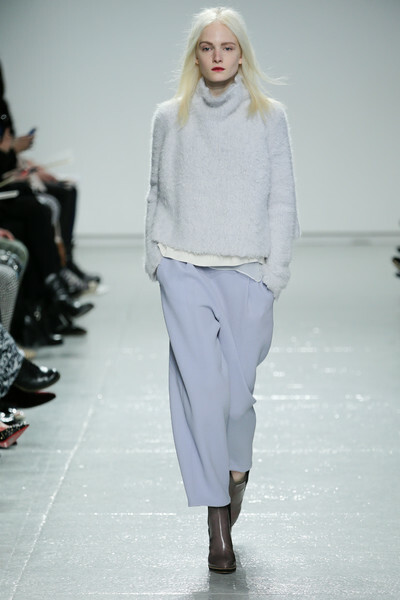 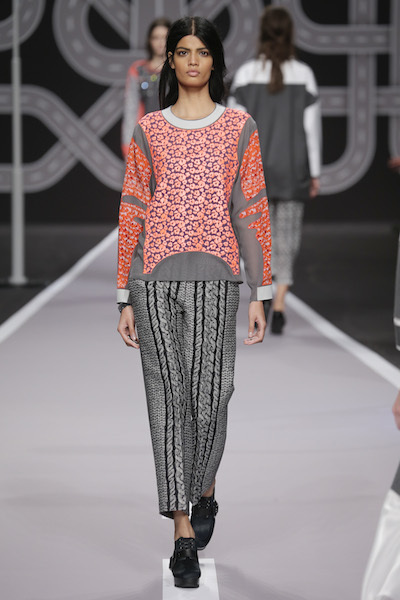 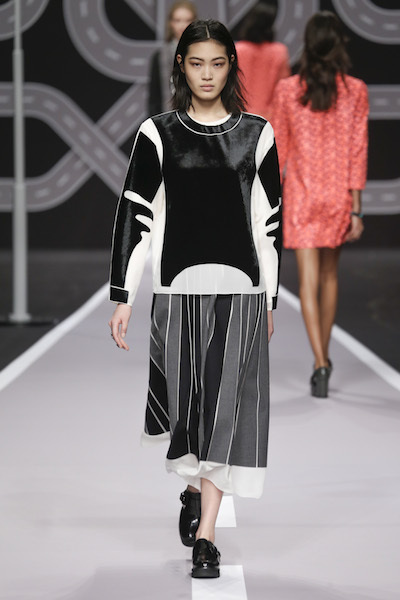 Light and calm, a cosmetic neutral palette and a play on pastels like the fabrics had undergone a beauty treatment. 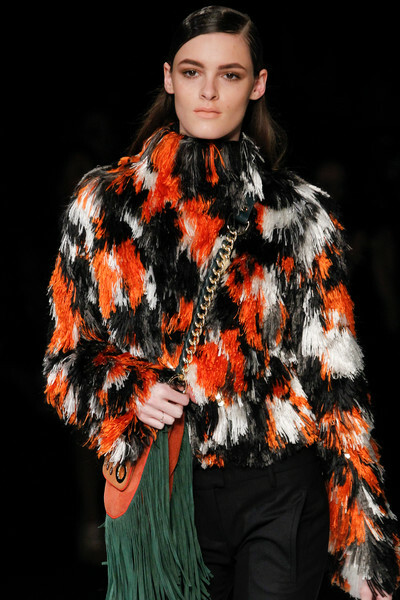 Inspired by the cosmetics of animal skins rather then ours. 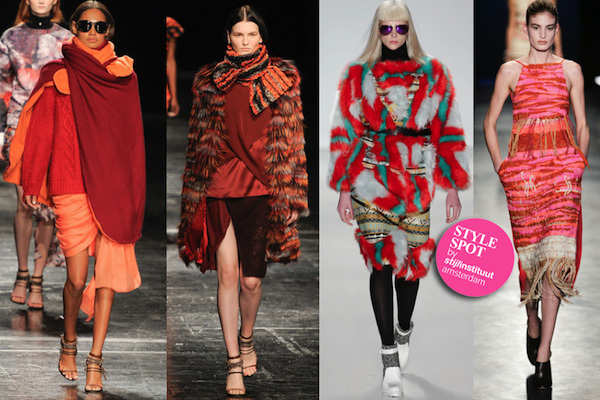 Heating up the body was not the only reason to source for warming spice shades, bundles of Mongolian lamb, cashmere wraps and joyful faux fur. 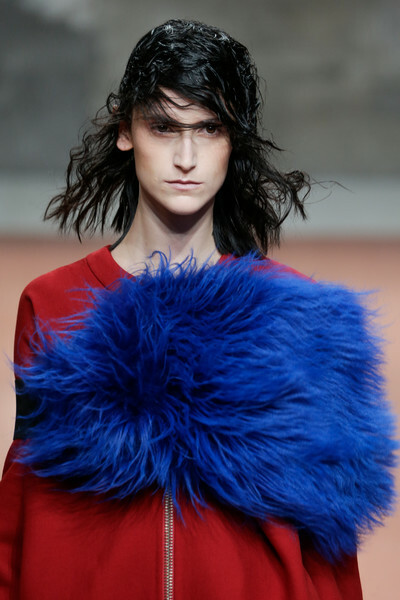 Where fashion increasingly tends to blend seasons, designers of today adore the extremes of winterly wild textures, fluffy organics and the voluminous sculptural aspects of pile surfaces, brushed hairy woolens and fizzy fringe. 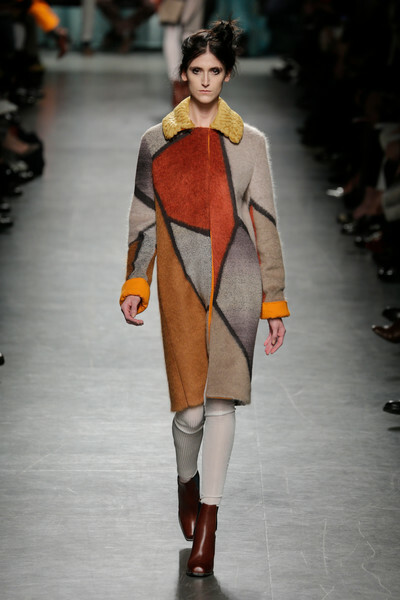 Prabal Gurung wraps pashminas high around the neck, collaging cashmere throws, woven knits and tribal trims in yellow, rust and orange. 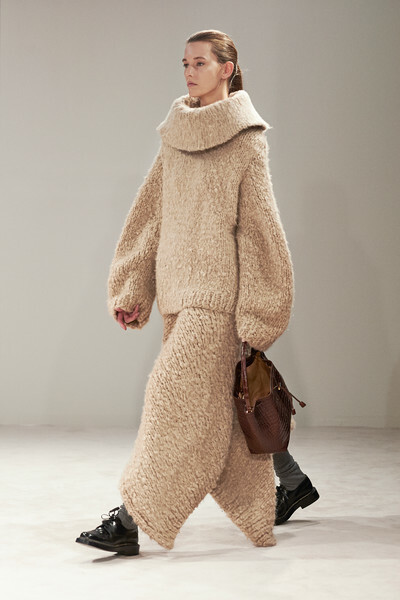 And that all in one outfit. 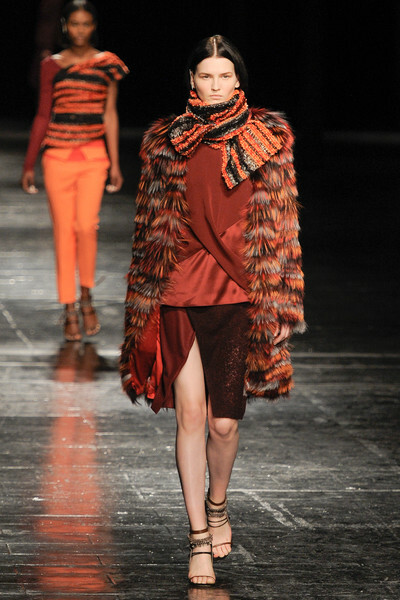 Crimson and ginger for meditative drapes inspired by native Nepal, his homeland. 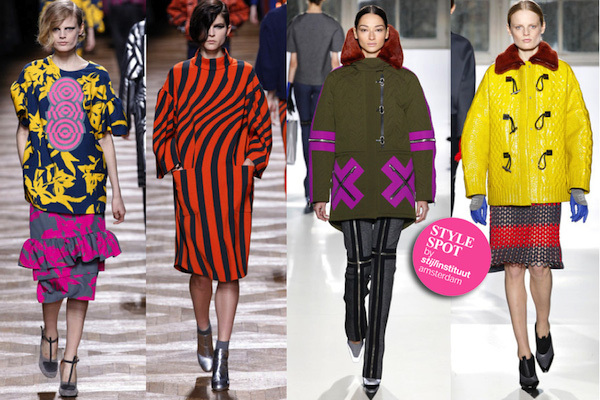 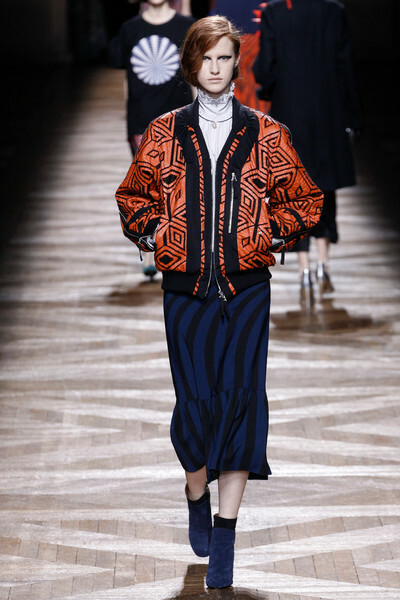 Custo confirms the love for pattern. 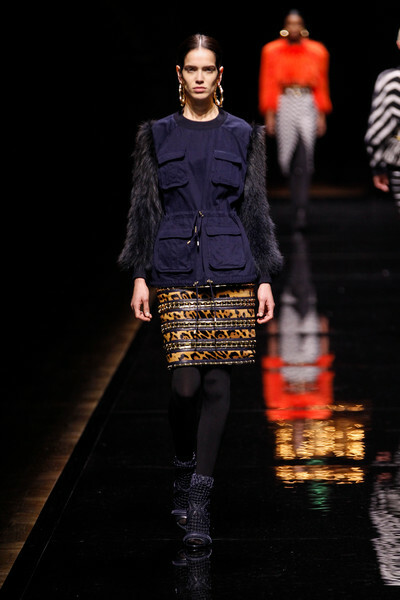 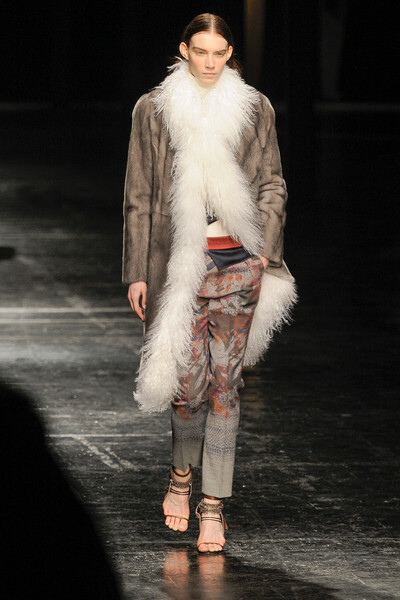 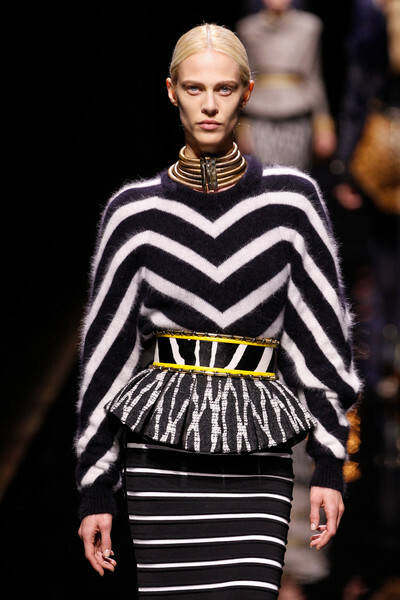 Showing clashing prints, plays with textures and lots of faux furs. 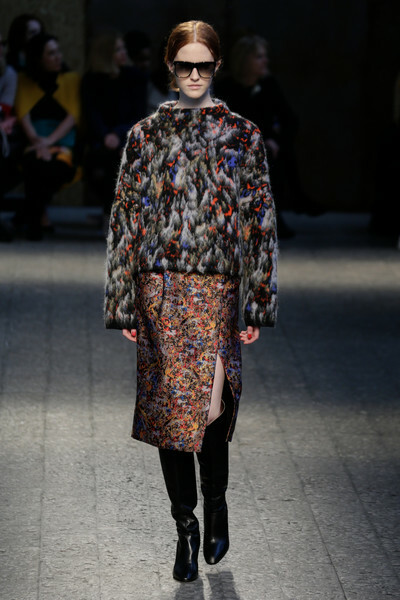 Altazurra adds fire to tapestry pieces, beautifully artful flourishes, inspired by textile artist Sheila Hicks. 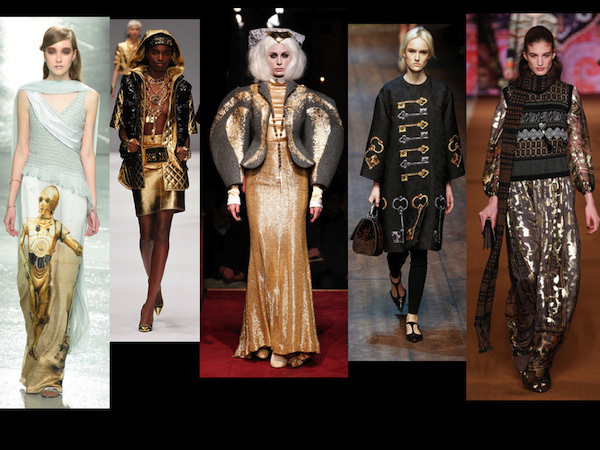 Let’s hope the high streets tap into this superb inspiration. 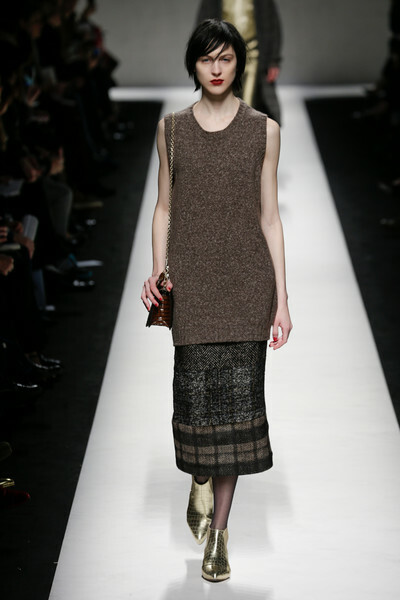 ‘A graceful quality with a touch of gorgeousness’. 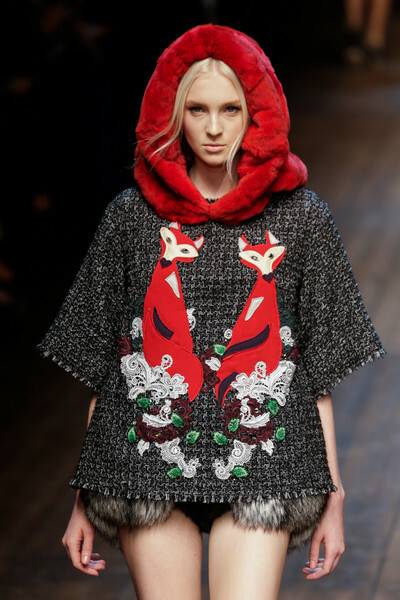 ‘Whimsical and charming femininity’. 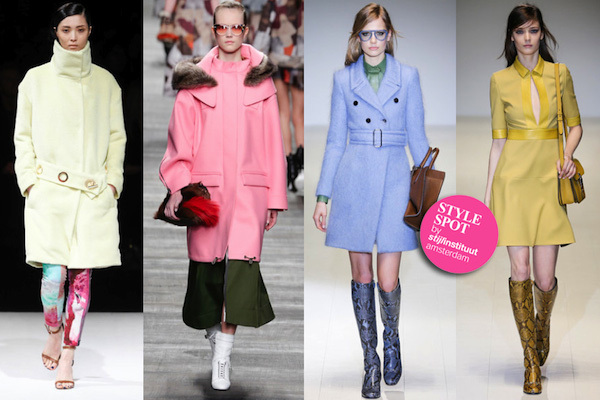 ‘Light as a rainbow after a brief shower on a sun-bright spring morning’. 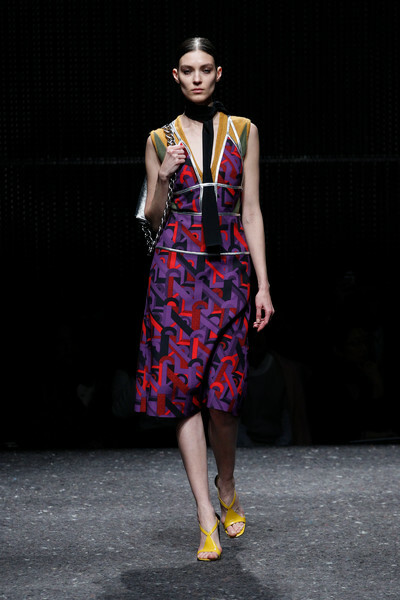 These where some of the qualifications dropped by the experts reflecting on the runway revelations of Lanvin, Rochas and Dries van Noten. 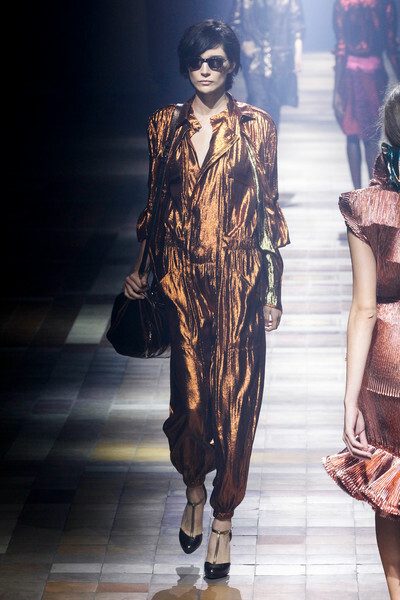 It was all shining bright with layers of pearlescent lamé, crystalline finishing, reflective organza’s shot with metal and airy fabrications in shiny nylon-filament yarns. 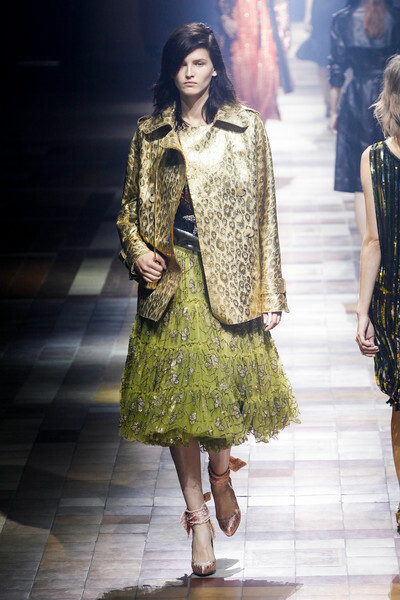 The loveliest of these shimmering lamé fabrics sparkled in bleached lemon yellow and pistachio. 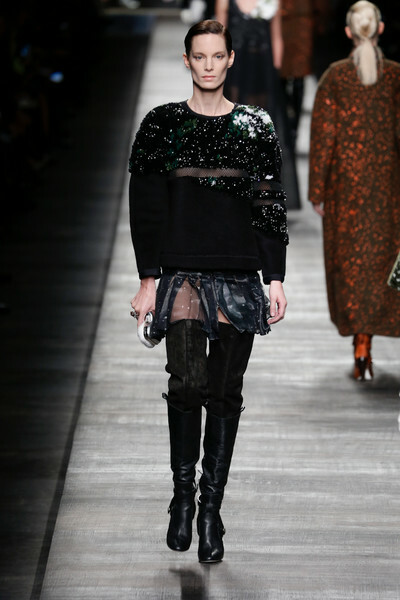 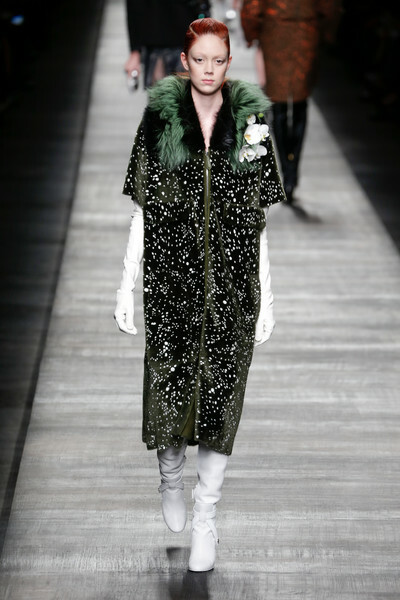 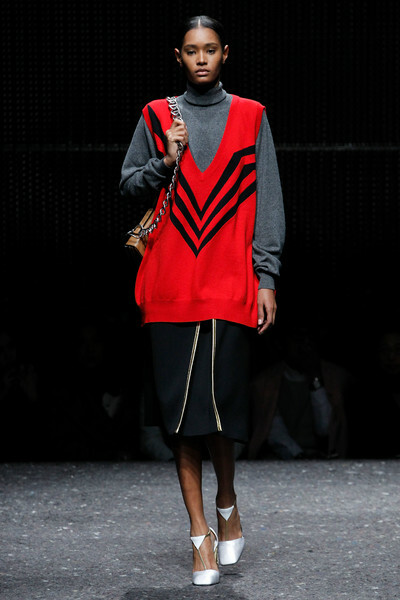 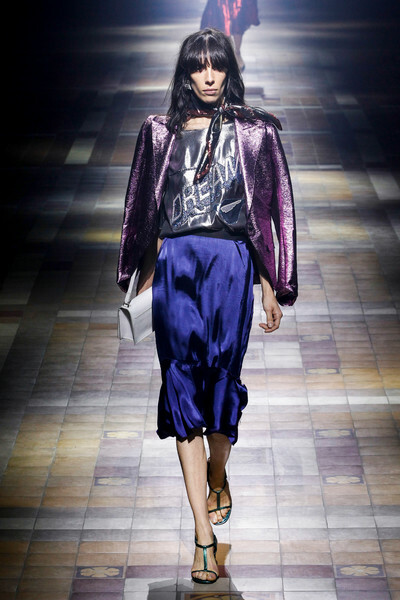 The Lanvin looks have a vast party quality – festive cocktail dresses and skirts and lush lamé total-looks in space-age jewel shades cheap generic viagra came splendidly glittering down the runway. 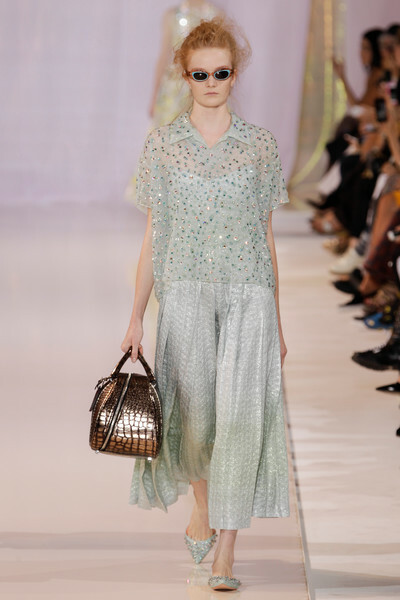 The Rochas outfits are meant to capture the translucent qualities of glass, frost, and crystals. 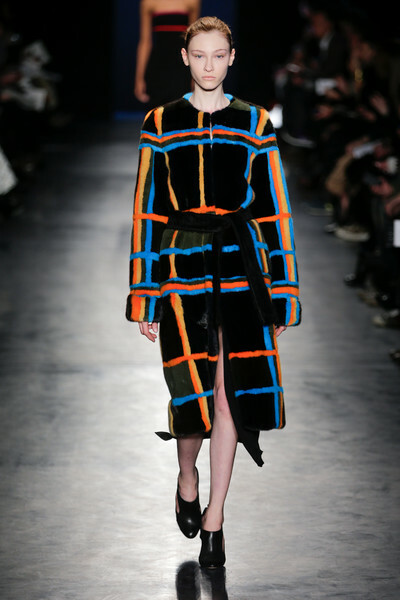 Rochas designer Zannini freaks out in jacquard velvet bonded to duchess satin and thermo-sealed with Swarovski crystals. 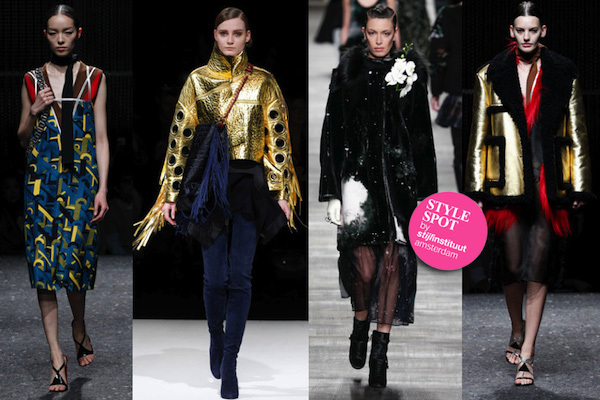 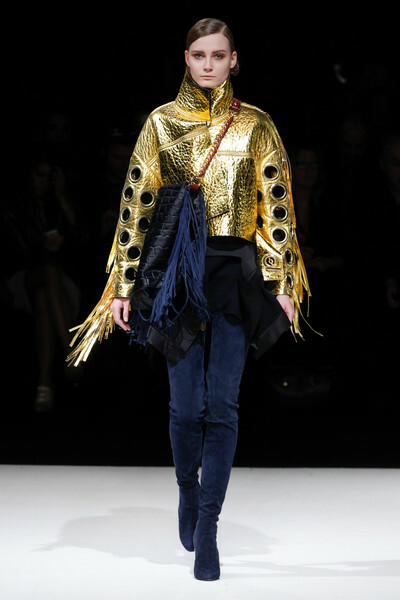 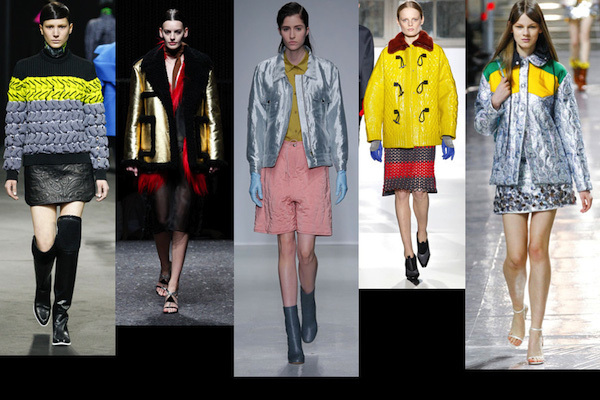 Everything glows and glistens, from pleated lamé to chartreuse technical fibre and spun sugar knits. 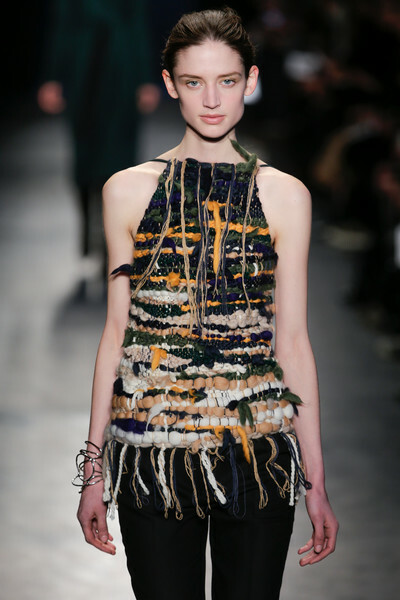 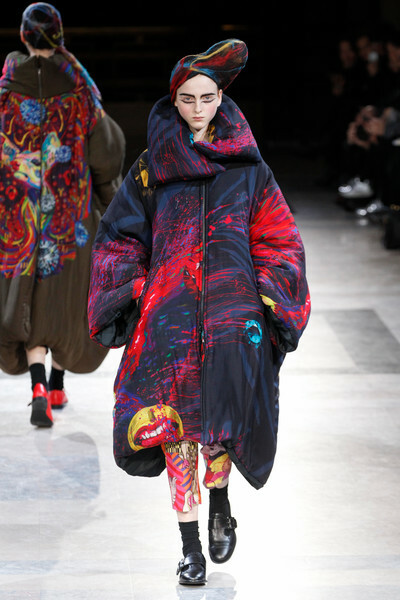 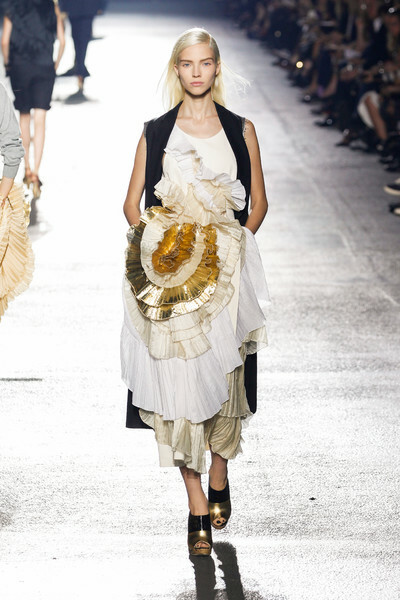 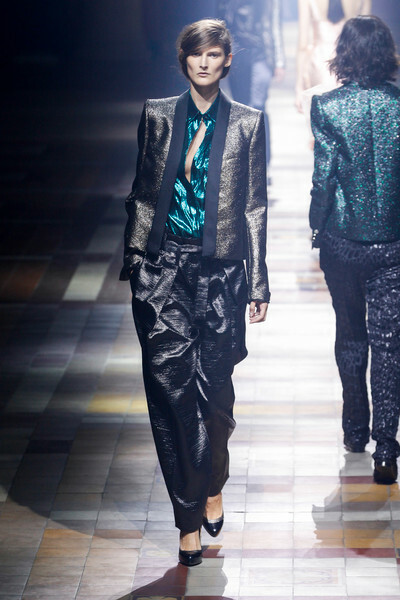 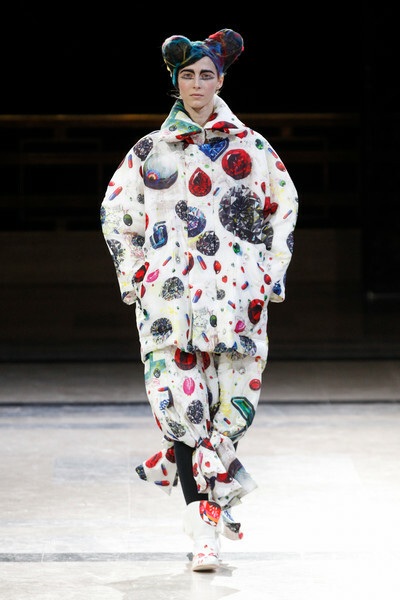 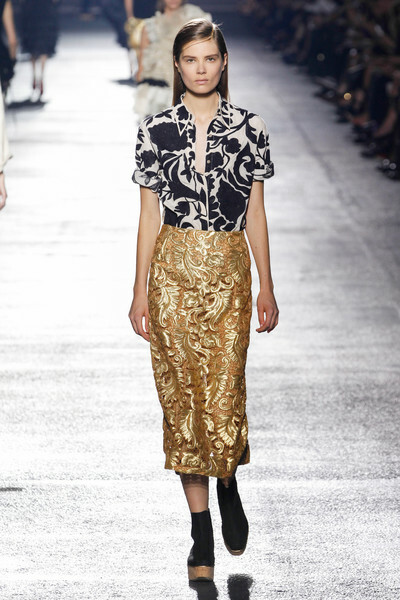 The detail of the Dries van Noten collection is nearing haute couture quality. 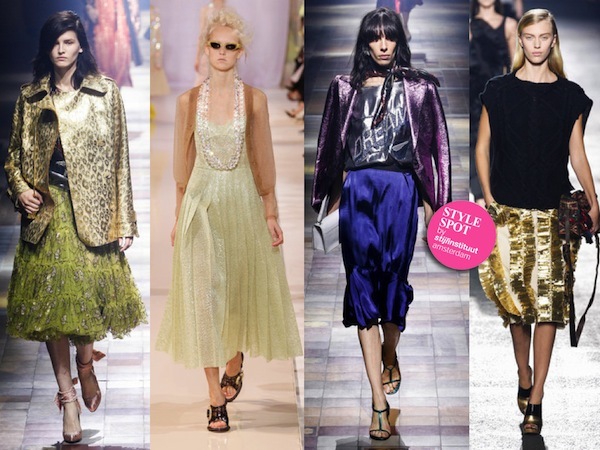 From micro-beaded gold shifts to simple cream skirts with tinselly gold ruffles. 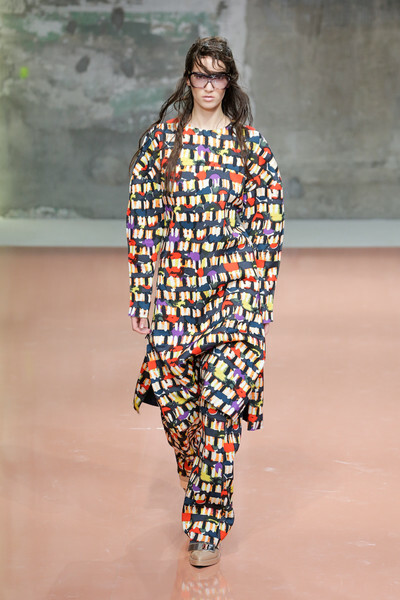 In this first Paris style spot artistic embellishment and intergalactic textile technology add magic to otherwise modern and wearable clothes.